The year is passing rapidly. We are almost at the best time of the year in Palm Beach and Whale Beach – Easter! The Council proposal to locate the new Creative Arts Space in the Community Centre at Mona Vale, which was approved by NBC at its February meeting, was a surprise to those who had been involved in the extensive consultations which the Council had initiated, including its Cultural Activities Advisory Committee. The expected site had been the Avalon Golf Club. As a supplement to this the Council has agreed to spend $260,000 at the Avalon Golf Club to provide artists’ studios and we hope that this can be increased. At present the lease granted to the Avalon Golf Course operators has only been extended for a period of 12 months so its long term future is not assured. The Avalon Golf Course is one of six which are owned by Northern Beaches Council. The Association sees it as a priority to preserve the Avalon golf course as public, open green space. The NB Council has produced a glossy brochure entitled Avalon Spotlight as part of the Avalon Beach Place Planning Process. The Avalon Preservation Association has responded with a detailed and constructive letter outlining the steps they recommend to produce an effective Concept Plan for the area. This is particularly important as the process of community involvement to develop Avalon in a way which suits its residents and businesses and meets their aspirations will provide a template for similar studies throughout the Council area. The Association feels that the Reference Groups, which have been set up by the Council, need to have freedom to reflect their views and those of their communities and believe that the Council needs to be open-minded until those views are known. IT IS VITAL THAT THE RELAXED VILLAGE ATMOSPHERE OF AVALON IS MAINTAINED. The Association continues discussions with the Council on Stage 1 of the Coastal Walkway between Norma Road and the Semloh Estate (345 Whale Beach Road). The President and Ken Alan had a very productive meeting with the CEO of the Northern Beaches Council Ray Brownlee on site The CEO has agreed to take a whole of road approach to the project. 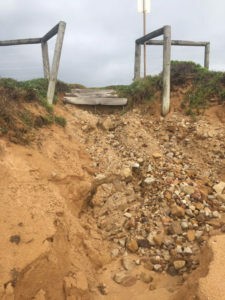 The Walkway is on the ocean side of Whale Beach Rd. We are waiting on the final plans which will include a review of the parking particularly on the western side of the road. There will also be a lookout at the junction of Whale Beach Road and Norma Road from which there will be spectacular views of the Central Coast to the north and to Manly in the south. The first Urban Dark Sky event was held to coincide with Earth Hour on Saturday 30 March. Tickets were sold on-line only by Fred Watson Tours & Events/Travel Ogg. 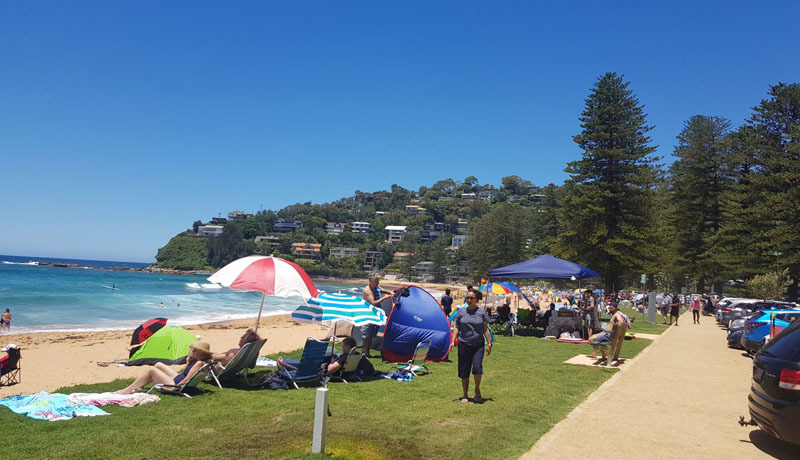 The event was advertised as a ‘Picnic in the Dark’ and was based around North Palm Beach Surf Club in Governor Phillip Park. The Surf Club sold refreshments and snacks. We are assured that future events will be planned in consultation with the Community. It should be noted that this is a commercial venture. We are awaiting feed back and consultation. Meetings have commenced to prepare the groundwork for the Local Strategic Planning Statement, the precursor to the new Local Environment Plan for the whole Northern Beaches Council area. Richard West and Martin McCallum are representing the Association. 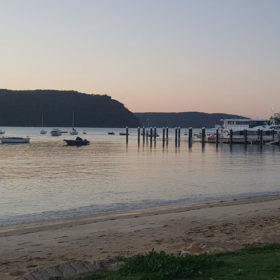 This plan is vital for the future development of Pittwater. The present LEP for Pittwater allows for low density, low rise residential development which is environmentally friendly. This is in contrast to Manly Ward and Warringah Ward which allows high density, high rise development. Installation of the new dish drains on Ocean Road as far as Ocean Place has commenced. The landscaping work on the beach is progressing well. Parking along Kiddies’ Corner will remain as it is. The Association has submitted to Council details of a number of continuing parking and traffic issues in the Palm Beach and Whale Beach area. We have had a response and will continue to advocate for improvements always trying to strike a balance between the needs of the local Community, visitors and businesses. The Council has agreed with our request to support the businesses in Barrenjoey Road near Nabilla Road by providing 2P timed parking spaces nearby and they have identified four in Nabilla Road near the corner which will alleviate the current problem of long term and trailer parking. This proposal will go to the Council Traffic Committee Meeting in April with the support of residents and businesses. We continue to suggest ways in which all available space can be best used to cope with the large volume of vehicles wishing to park in the area, particularly at weekends and holiday time. If you have any suggestions or are aware of any particular problems please let us know. Coin operated lockers will be installed by Council at Palm Beach Ferry Wharf by Easter to assist travellers using the ferry or other boats who need to leave their luggage and goods at the Wharf while they park. Following our request, the Council has agreed to provide additional temporary toilets, signage and rubbish bins at peak holiday times. We have also asked for some of the existing picnic tables to be more sympathetically sited in shade as many of them are in direct sunlight and it is too hot to use them on a sunny day in summer. The Park is very popular with visiting families and additional tables would also be welcome. 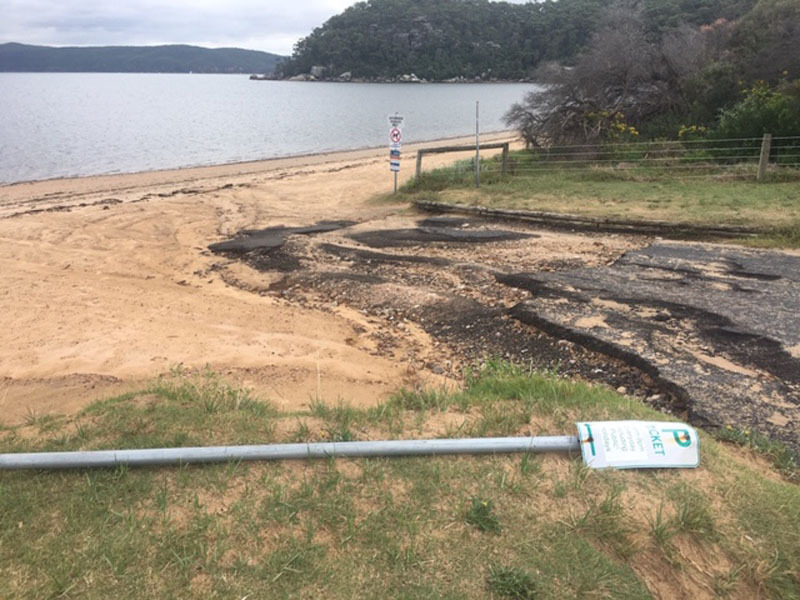 On April 1st we alerted Council to the neglected, poor condition of tracks, pathways, the boat ramp and damaged signs and fences at North Palm Beach. We will advise the outcome as soon as information is received from Council. THE OFF LEASH DOG TRIAL STATION BEACH. The final report from the Community survey (Have Your Say) is being prepared by Council staff for the Councillors. The feed back we have had is that the results of the survey showed that 90% of the Community are in favour of the TRIAL going ahead. 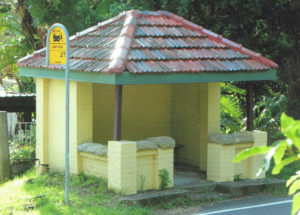 The final plans for the reconstruction of the the heritage bus shelter have been approved by Council. It is expected that the construction will commence in the next couple of months. This has been a long awaited project. I wish to thank our previous long term committee member and now our honorary architect Bruce James for his hard work which has brought this project to fruition. Council has also agreed to install some steps on the steep grassy verge on the corner of Surf Rd to improve pedestrian access to Barrenjoey Road. Details to come. Living Ocean is an ocean conservation group based on Sydney’s Northern Beaches promoting awareness of human impact on the ocean through research, education and community action. They are alerting the Community to proposed seismic 3D testing in the PEP11 zone between Sydney and Newcastle – just up the coast from Barrenjoey Headland – with the objective to potentially industrialise the nearby ocean for gas and/or oil. This would result in major dynamic change for the area. Science-based evidence shows that ocean noise, such as sonar and seismic testing, has potentially wide ranging and devastating impacts on whales, dolphins and many as yet not studied forms of marine life. We will monitor the situation. I have congratulated Hon Rob Stokes on behalf of the PBWBA on his re-election as the member for Pittwater and we look forward to continuing to work with him. We also note that he has been appointed as the Minister for Planning and Public Places – a role for which he is very well qualified. As I have mentioned above, planning is a very important issue for Pittwater. Committee Meeting 7 pm Pacific Club Monday 8 April. All members welcome to attend. Informal Coffee Morning 10.30 am Moby Dicks, Whale Beach, Monday 29th April. Please refer to the calendar on the PBWBA website for dates and venues for coffee mornings for the rest of the year. All members, friends, neighbours & new residents are welcome to attend. I would like to wish all our members a happy and peaceful Easter.